Hey guys! Hope you had a blast this past Memorial Day Weekend. I've always loved Memorial Day because it kickstarts the summer (and hopefully the summer weather) and it also reminds me to be mindful of how blessed and privileged we all are in this country because of all the men & women who serve it! Anywayssss back to babies! I've gotten quite a few emails and messages lately asking me to go into further detail regarding CIO (cry it out) and how and why to do it. I wrote a short post here you can check out but I'm going to go into further detail now! So, crying it out is basically letting your baby cry before falling asleep. You can take that a million different ways. I'm just going to let you know MY version of CIO and how we used it in our family. You are probably reading this because you are pregnant and preparing or have sought out advice on CIO because you are tired or all the crap it takes to get your baby to fall asleep right now. The reason I know this is because I looked for posts just like this one in both of those situations. However, I have yet to look up any advice on it since having Chatham because she's a whole different ball game. She has been an amazing sleeper pretty much since the beginning. So, I have 3 great sleepers- the twins who I literally made good sleepers and Chatham who was born a great sleeper. The reason I'm telling you this is because sometimes CIO is not necessary. And seriously, some first times moms are actually lucky and blessed enough to have a baby that sleeps through the night without much effort!! It's okay to be jealous of them! I was when my twinnies were little. Good news though! 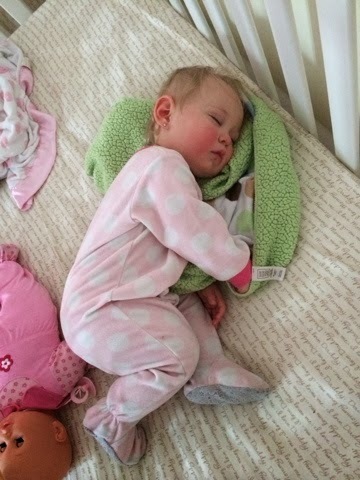 With a little technique and practice, you can train your baby to be a great sleeper and Y & H are proof of that. It's going to be tough and emotional and there are going to be moments when you don't know if you're doing the right thing. You have to be fully ready. It's not fair to your baby to let them cry, then decide not to do it, then let them cry and regret it and pick them up. It's confusing to them and it's fair. Give it sufficient time and if you really aren't ready, then stop practicing CIO and don't try again until you are ready. You and your partner should be on the same page. It's going to be futile for you to be putting in time and effort of crying and going through an emotional roller coaster and then having your husband/wife/partner/parent feed/rock your baby when they start crying. Don't just tell them you're going to do CIO. Have a good discussion about the benefits, show success stories, agree on a plan, etc. There are a few decisions that need to be made before you begin. Decide on: how long you're going to let them cry, what to do once you've decided they've cried long enough and need your help, etc. Helping your baby to be a good sleeper doesn't happen overnight, it can take up to 2 weeks for a good routine to kick in. Don't just assume after a few days of long crying times that it's not working. It's usually pretty soon after that that the routine kicks in and your baby starts going to bed much faster. I mean this with complete sincerity- be respectful of your baby. Choose a time when they are not sick or teething, you are not going on vacation or having them sleep somewhere new anytime soon and stick with a routine. The reason I can give these 5 tips is because I lived them. I knew I was ready with the twins when I started crying to my husband because it took SO much work to get them to bed and by the time I got the 2nd one pretty close to falling asleep in the rocker, the 1st one started to fuss again. I sat down with him, described what my day was like trying to get them to bed when he was at work and why I couldn't do it anymore. I showed him a few blogs and read him a few posts on older happy and healthy kids who's parents had practiced CIO and their children were great sleepers. We set a plan together that for the first few times, we would let them cry 15 minutes, if we were still feeling strong then we would let it go a little longer. I began to learn their cries really well. I knew a whiny cry meant I'm going to fall asleep soon. I learned that a high pitched screaming cry meant I need my mom/dad and I would go and rock them or sing to them and calm them down and try again. The first nap we tried CIO on, I cried the entire time too but knew I HAD NO OTHER OPTIONS. As a mom, I was all out of ideas. It was either let them cry and soothe themselves to learn how to fall asleep or I would continue to spend hours of rocking and putting the pacifier back in, and reswaddling, etc etc and my life would remain the way it was. The second time was much easier and the third time was harder then the first. That's why I say rollercoaster. For a few weeks it continued like this but with the overall theme of getting easier. Now- I'll tell you my thoughts that got me through the roughest times and I've told these to my friends that have also done CIO: I am their mother. It is MY job to teach and train them in this world. I will teach them to try and be good eaters, to have good manners, to respect people and be kind to others. I will train them to ride a bike, play a game, learn patience, share with their friends. And in that same thought process, I will train them to be a good sleeper. I will train them that they can learn how to put them selves to sleep and that they don't need me to help them fall asleep. I'm not abandoning them or letting them cry until they just pass out- I'm learning their cries and signals as their mother and using them to help me learn when to step in to help them get to bed and when it's okay for them to cry a bit before falling asleep. And, my last thought on CIO- it is ABSOLUTELY THE BEST DECISION I HAVE EVER MADE REGARDING MY CHILDREN! My twins who are now 19 months, go into bed, jump around, read a book, talk to each, laugh, and then finally fall asleep- almost every single nap and bedtime. It is a dream. 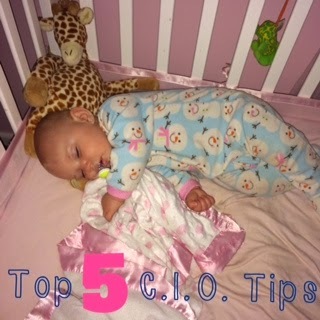 They sleep almost anywhere and we only have to use CIO with them probably once a month- and it's usually when we are on vacation or at someone else's house in a crib they aren't used to. Chatham, 8 months, who I haven't had to do CIO with, usually goes into her crib with a pacifier and a blanket and crashes. Every once in a while, she'll cry for about 10 minutes and I know her well enough to do that if she doesn't go down right away, I just bring her out to hang for a few minutes and try again. All 3 take a nap from 11:45am-2:45pm and all 3 take a bath (usually Hudson gets out first after injuring one of his sister's) and get into bed at 6:45pm (usually talking, babbling, reading until about 7:30pm) and wake up at 7am (but read, chat, hang out until around 7:30am unless we're not at home). So it works! And it makes life manageable and having babies and toddlers and kids not nearly as stressful as it is without getting much sleep. Hope this answers a lot of the questions you had/have about CIO! Please contact me if you need support or have any more questions- I get it, I've been there! Hi Jackie! I found your blog when I was googling a lot a few weeks back trying to help my little guy establish a routine. He would sleep perfectly at night but daytime naps were problematic. We found a good rhythm and he was doing EXCELLENT. He would lay down and fall asleep very quickly with minimal fussing. Then last weekend we went on vacation and suddenly EVERYTHING was upside down. Now we are up two times a night again and naps are NOT going well AT ALL. He will fall asleep quickly still but he won't STAY asleep. The 45 minute intruder interrupts, I will leave him to CIO and by 15-20 minutes he will have worked himself up into quite the lather. If I get him up then though he will be tired still and we have now set the rest of the day up for napping FAIL. I decided to try to keep him up LONGER because maybe he was not tired enough thus not taking a long enough nap. BIG MISTAKE. The naps suddenly shortened to 20 minutes and poor child was miserable. Now he is my first baby but I am not unfamiliar with babies as I was the oldest of 10 children and have nannied most of my adult life, most recently with babies as young as 6 weeks. I guess I didn't put that much thought into it with them and they were "naturally" great sleepers. I can tell my Isaiah needs his sleep just like mommy but for some reason he is having a hard time. While on vacation we had so much trouble and he was drooling and chewing so I gave him some tylenol one day and he took much better naps. He did great the first 48 hours home but then suddenly everything went south. Tylenol has not made a difference so I decided he wasn't hurting. I then suspected perhaps my milk supply was not keeping up and he was in a growth spurt but after he nursed at 5:45 this morning and fussed the entire time I pumped 1.5 oz in about 5 minutes time so I can assume it's not lack of milk (and he went straight back to sleep with no complaining once I finally stopped nursing him). It's almost like he's getting disturbed in his sleep and has to reset before he can go back to sleep again. I have been reading there is a 4 month sleep regression too. Does any of this sound familiar to you? Do you have any recommendations on what to do? I had no idea the vacation would be such an ordeal because I tried to make it just as much like he is used to with his pack n play and sound machine. He takes great naps at his nana's house and at church! I feel so bad for him. Megan- I've so been there! All of a sudden you're great, relaxing vacation becomes the worst decision you think you've ever made. And it's such a mom thing to question everything- like teething, milk supply, pack n plays, etc. There's 2 things you could try- 1 is when we wakes up from his nap, let him cry for 20-30minutes if you feel comfortable. If you feel like it's not going to work, pick him up, no talking and try not to even make eye contact, calm him down a bit and try and put him back in again. I've done that a few times with Chatham- my third and she does great with it. My twins- not so much, haha. Option #2 is put him down for bed a bit earlier. We tried this with the twins and shockingly, it worked and they were able to settle themselves into a better/longer nap. Bottom line is it sounds like you're doing so much right and he might just be going through a short phase that will pass. Let me know how it goes!! Thanks for reading! Hi, I found your blog while holding my twin son for one of his naps. I was wondering at what age you started sleep training your twins? I definitely need to train these two - I just am not sure when to start. Any advice would be SO appreciated!! My daughter is 3.5months and used to be great about being put down and would drift off on her own but the last few weeks she has started to scream when we set her down for bed/naps even though she was calm when we were holding her.. Do we let her cry from the time we set her down?